Because Thursday evening after the nice Tibetan dinner With Tarte au citron dessert with my wonderful French- American host family I spent 3 hours getting my foldingbike in my suitcase… (Oh, why is it in my gene’s that I need to cycle????????????!!!!!!!!!!!!!!!!) I didn’t have time to write my blog contribution of Thursday the 16th of July ; to be followed later on. 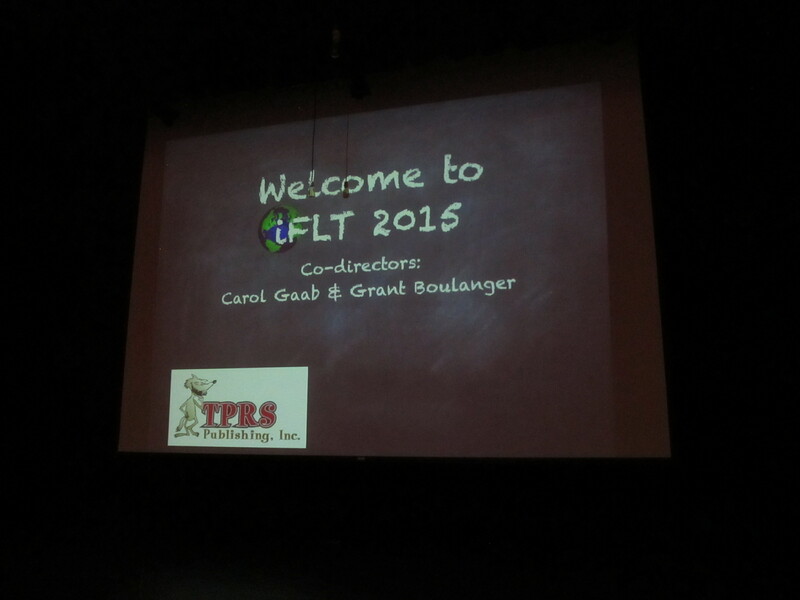 Today iFLT15 started in Tartan High School in St Paul, Minnesota. How great to meet so many nice colleagues again and to be able to talk together ‘life’! 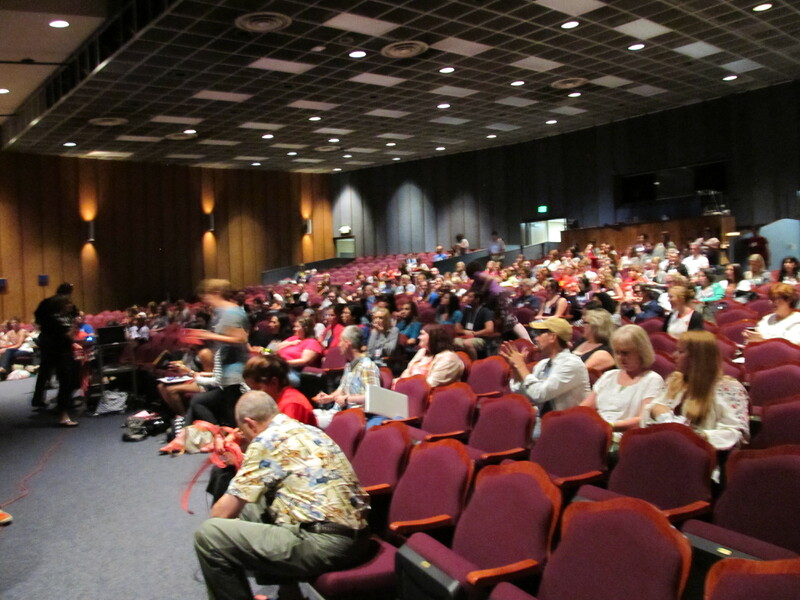 Carol opened the conference and then Darcy Pippins told about the succes of her students at the AP exams. The worry of a lot of teachers concerning TPRS is: will the students meet the requirements? Darcy showed that her students did very well at the AP exams, without any verb charts or whatsoever. 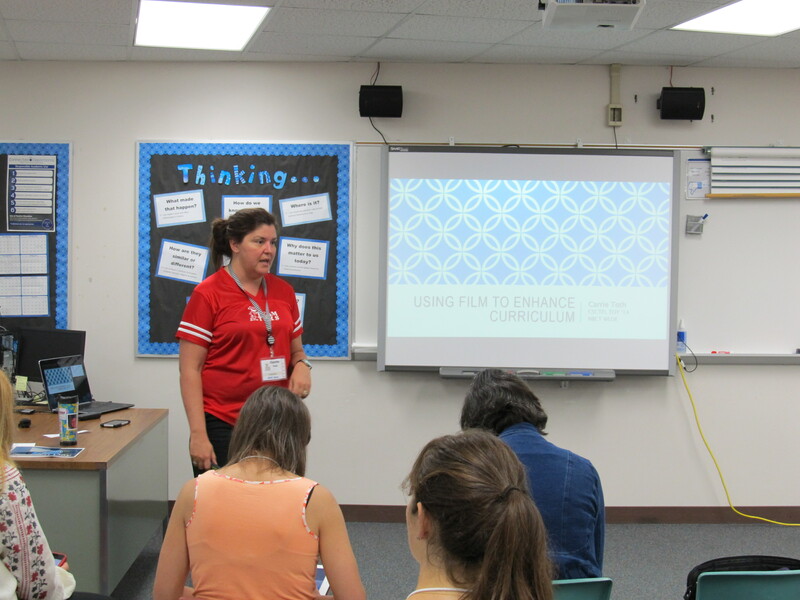 Then Kristy Placido and Carrie Toth talked about Global competences through service learning. They told that lathough they’re living far away form each other they’re cooperating a lot and that their students are in contact with each other. They promoted cooperating with other colleagues. They talked about their cultural units and how they backward plan them and how they try to find people in their town who can make it more personal. Activities Kristy and Carrie performed are Kids helping kids by raising money and with this money helping other kids in Spanish speaking countries to be able to go to school (Kristy) and a Spanish snackshop (Carrie) and the money they raise with the snackshop goes as donations to different projects. 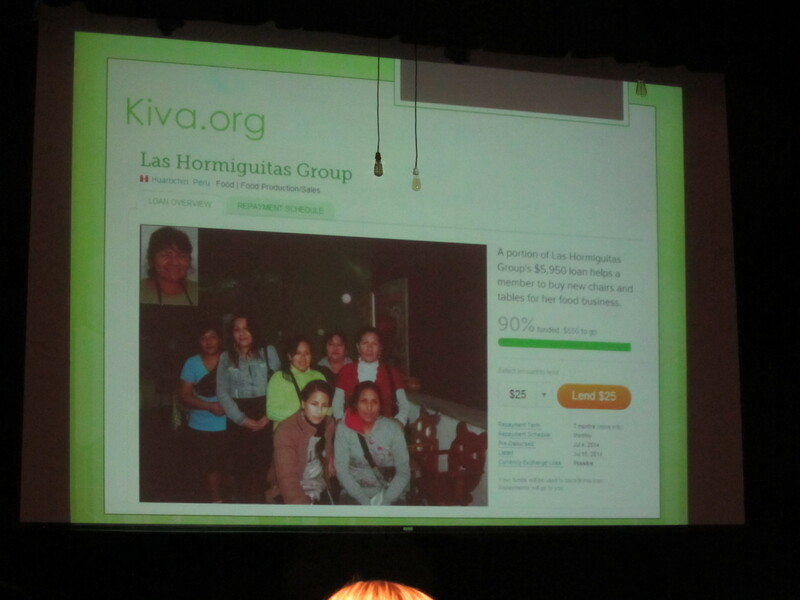 They talked about microfinancing at Kiva.org, loans that change lives. Empower people around the world with a $25 loan (I wrote about this last year too, when I was in the workshop of Leslie Davison; I wanted to use it last year and I looked up things for Frenchspeaking countries, but finallly I did not use it in class and I definitely want to use it next school year). All this was done to raise the awareness of the students of important things outside their own lives and towns and that it’s useful to be able to communicate in another language and to know about other cultures and how you can make a change by acting. They also gave some practical tips. I liked the “Wordle battle” Carrie mentioned: you make a wordcloud at Wordle.net of a song you’re going to use in class. You work in pairs and you give each student one wordle. 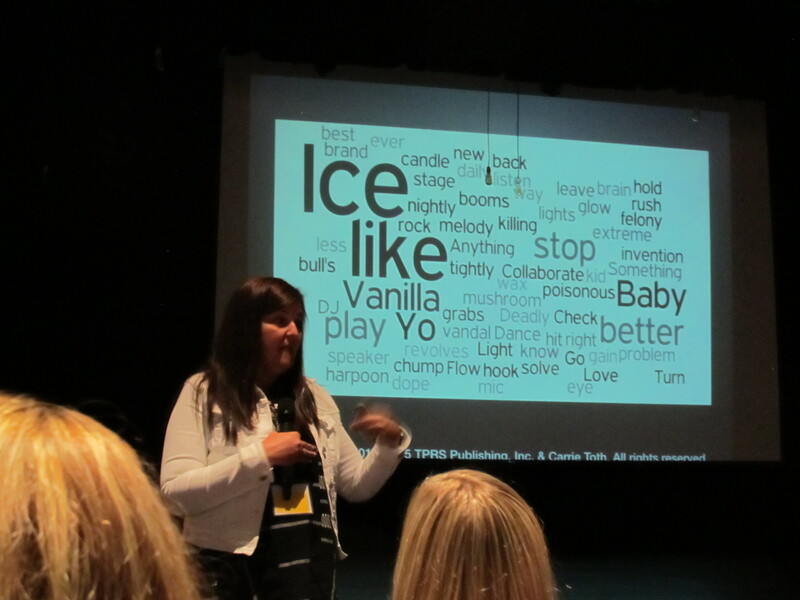 You start the song and the students have to encircle a word when they hear it in the song. The one who has the most encicrled words wins. 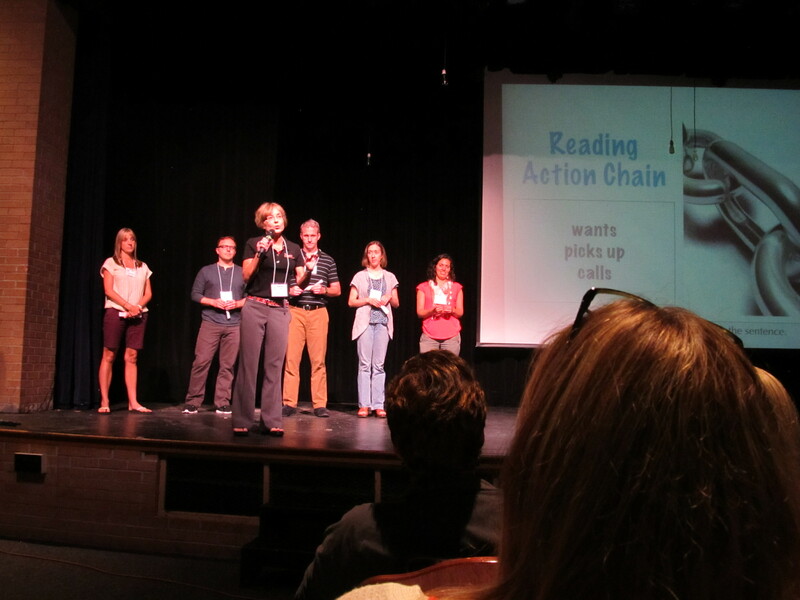 Carol showed the reading action chain. 5 persons had received a small piece of paper and on it was written a sentence. 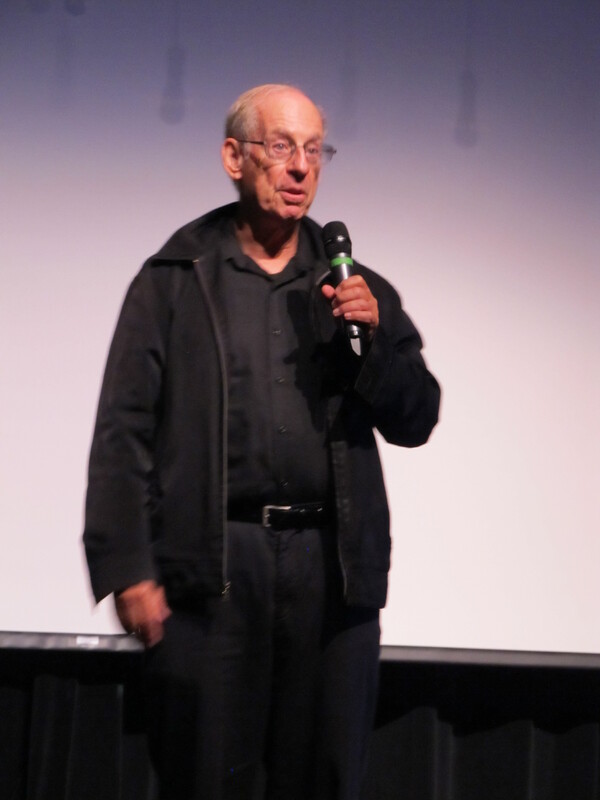 They had to show the sentence – withhout telling it – and they could use dialogues. We had to guess what was written and give a chorus answer. With it Carol had written an UNparallel story : more details to the story, which gave e.g. information about the way things were said, or why or how. 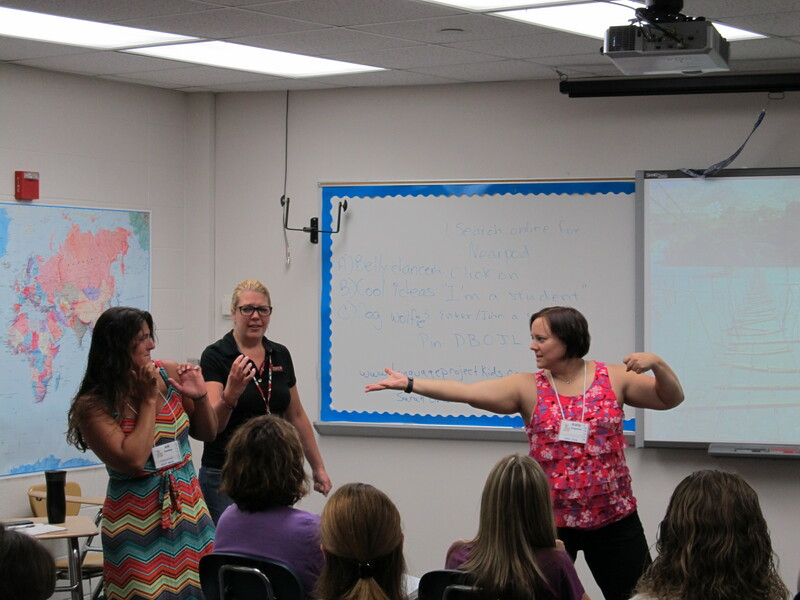 After the lunch break Carol Gaab did the session for the experienced TPRS teachers. 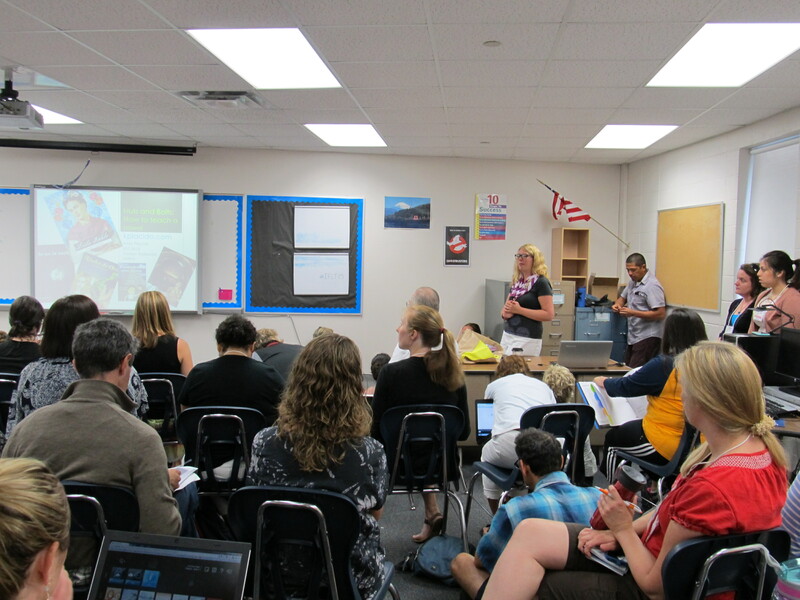 She talked about and showed examples of staying in flow with CI Strategies, differentiated instruction. 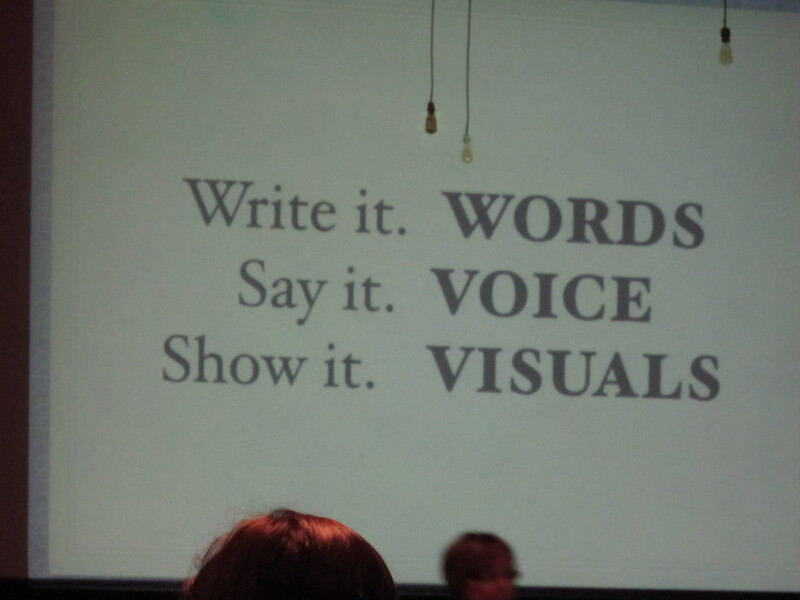 How do you create & keep input comprehensible and compelling? Define – Refine – Combine. High frequency vocabulary, relative to your students needs & interests, situationally appropriate vocabulary. Content based CI. Carol showed a lot of examples of what she does with the baseball players she’s teaching. She can not do plain stories with them; she adapts what she does with them; somehow it made me think of the traditional way of teaching. It’s the repetition that counts and the way you can keep your students interested, although you’re repeating. Tomorrow, Tuesday the 14th of July – but for Europe it’s already today – iFLT15 will start. 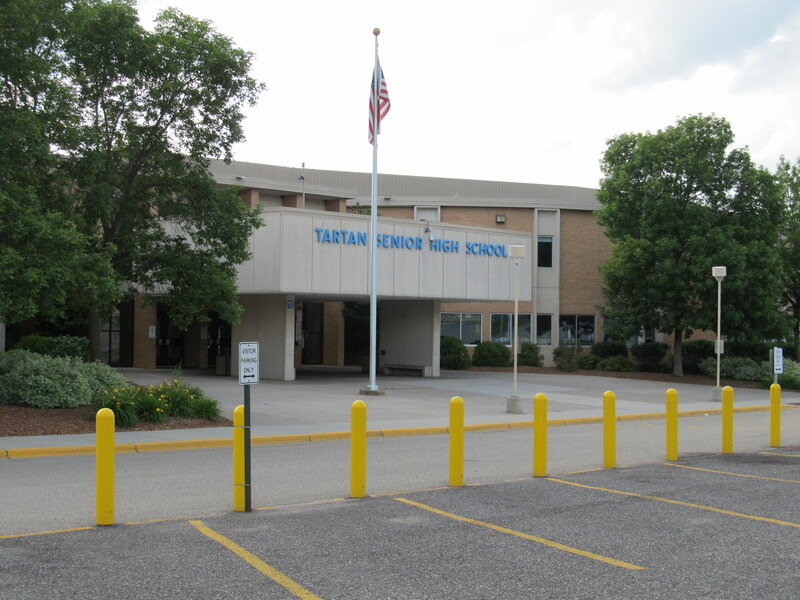 It will be hosted by Tartan High School in St Paul, Minnesota. Registration will start at 8 o’clock and the conference will start with a plenary session from 8.30 till 11.30: Discovering the Power of TCI. Already the last day?! And I even slept 40 minutes longer: 6.40! This week went so fast! Yesterday evening Contee and his wife Maggie invited me to go to Root Down, a great restaurant and it had a.o. glutenfree and vegan/vegetarian dishes. We didn’t make a reservation and we were lucky we were in time, because it was really crowded and we had a table and fortunately we did not have to wait on the list. We had delicious food! And the desert, wow……………! (Samm is the pastry chef: we’ll certainly hear more from her in the near future I expect!). Here you can take a Root Down virtual tour. Start kind and then keep iron discipline – but stay kind! Start teaching your language and then do the routines as they come up. At the end of the first lesson Bryce tells the students they are going to do a game or have free time on Friday, if they are always on time, if everybody is quiet and is collaborating. 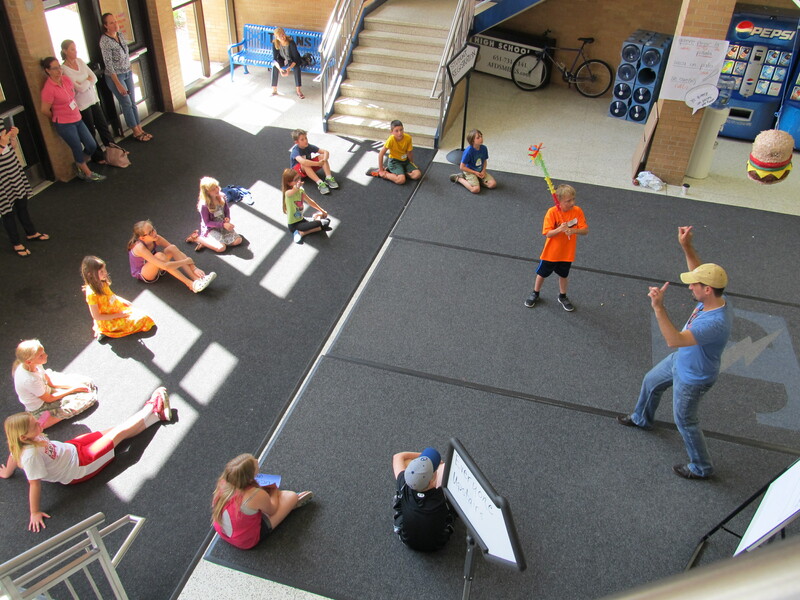 The class gets 3 points for it and one student’s job to note down the PAT points (Prefered Activity Time). 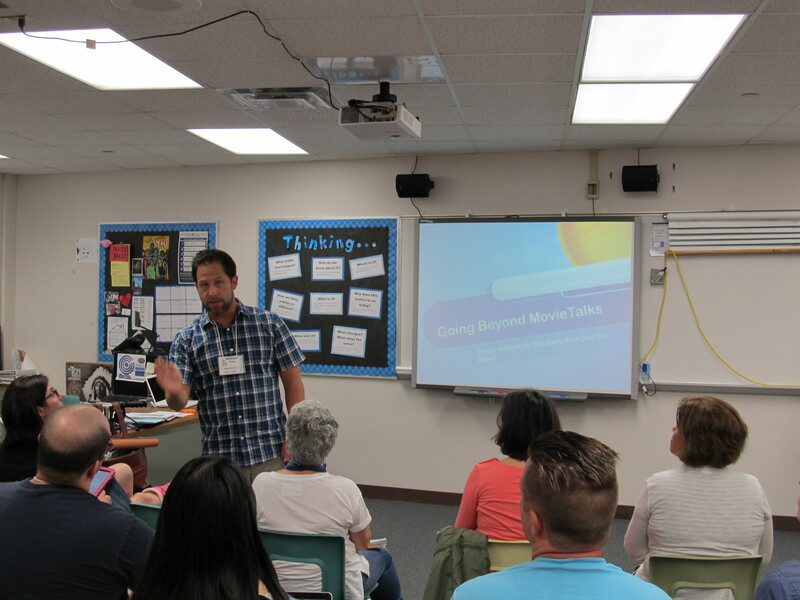 Bryce shows funny video’s when the students are entering, so students have to be in time to see them. Bryce has all kinds of jobs for his students. It’s one student’s job to switch it off. Bryce has a project – and he already starts in lesson one, also at the lowest level : la persona especial. 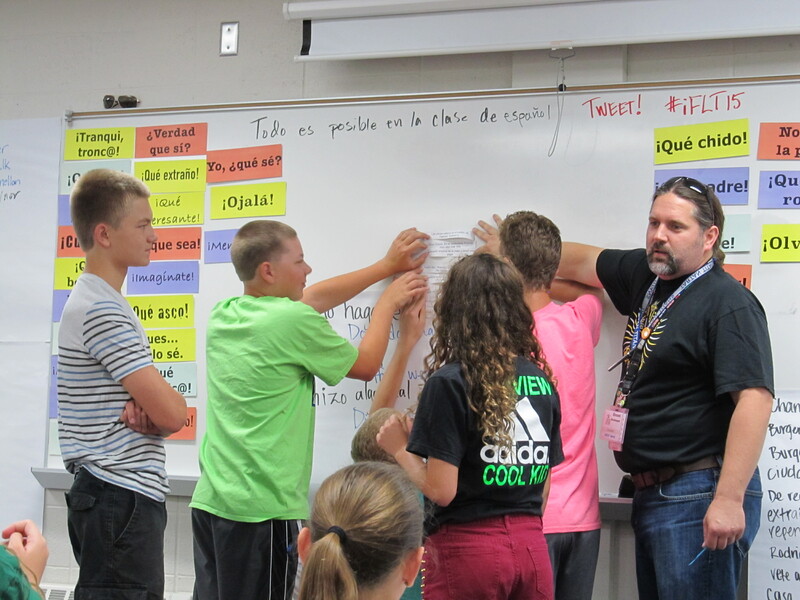 Bryce interviews students in the class in the target language and every time they talked about 5 students, they have a quiz – one a week. It’s easy for the students to know, because it’s compelling and this way they get to know each other. The students grade each other, two students have to put them in alphabetical order. The big idea, both with acceptance; all of us are working together, we’re a community. We all have roles in the class. Bryce takes care to make contact with all of the students, talks to those who are in time. Report is important to Bryce, but he is not so much interested in their favorite actor, singer, sportperson but more in what do they like to do: real things about real people. Bryce’s favorite question is: what are you not good at yet? It has so many layers. At the end of the lesson Bryce bows and says: “Gracias por aprender” and the class answers: “Gracias por enseñarlos señor”. After Bryce’s classroom management workshop I wanted to observe in the learning labs, but I did not know which one to observe. When I was in Joe’s lesson, I heard another teacher yelling a lot, in the fire of a story and it did not really attract me to go there, but Mark Dellaney happened to be this teacher and someone told me to go there, so I didn’t not want to follow my prejudice and I went to observe his lesson and I really loved his Spanish 1 lesson to middle schoolers! After the lesson we did the debriefing and Mark answered all the questions; here some of his answers. Mark backward plans from a novel and that’s the vocabulary he will work on. He does pre-teaching per chapter –Mark knows very well where he wants to go to. He picks one thing/word and works on it all different ways. Mark thinks his best props are people. A door: a kid, the golden gate, some kids etc. But he also has e.g. funny hat’s from UStoys, like the pizza hat. Mark only gets the actors up until everybody gets the story, once the story is established. Mark’s students write a lot – he did not do that during iFLT, because that would be boring to observe, to see the students only writing; he all grades them. He has a rubric on ACTLF. It can be found on CIteachers.com (it requires membership). We had lunch and the closing session. Of course a lot of people were thanked by Diana Noonan and Carol Gaab and special thanks to Ben Slavic, because he “is retiring again”. A group of colleagues who worked with him together spoke some funny words, but Ben was not allowed to say anything, because “he talks too much”. He tried several times to get the word, but was severely spoken to he did not get it. He obeyed. Sorry for the dark photos – it was quiet dark in the conference room. Collaborate : find a buddie! Everybody has his own team and everybody has his favorite player, We’re all part of team TPRS. Anybody that cares for kids, can do this! It’s already Thursday! This morning I awoke again at 6 and could not sleep anymore. Daniel and Judy Dubois from France also have this… It must still be the jetlag. And I think because of that, I mixed things up and I went to observe in the learning lab in the first round, but it should have been in the second round… I went to Joe Dziedzic’s class, teaching a Spanish 2 class. It was a calm group; as is Joe. The class was very supporting him. It’s very nice to see all those different teaching styles. After the break I went to the workshop of 7-months-pregnant Martina Bex. She has a blog: The comprehensible classroom. She had a very interesting interactive workshop “PQA hooks”. 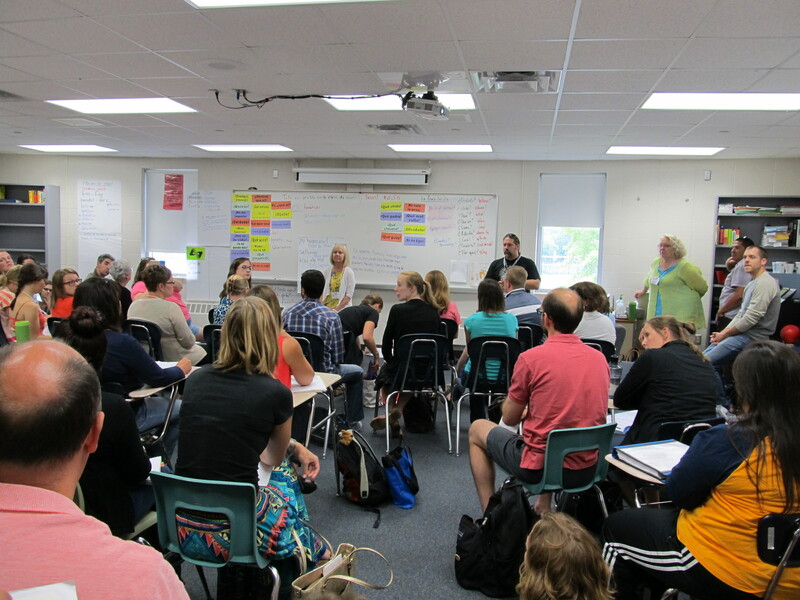 Martina calls PQA (Personalized Questions and Answers): a teacher facilitated discussion with students about students. She used several primary school games and teamwork activities with personal questions, containing certain grammatical features in order to have the students work and communicate together in the target language. When I was waiting in the hallway during lunchtime, suddenly Susan Gross came along! What a nice surprise! I heard she did a small lecture with the beginners and of course she said: Nothing motivates like success! After lunch I went to the engaging and highly inspiring workshop by Leslie Davison: 20% projects. I did not know at all what it was, but I found it an intriguing title and someone in the hallway said Leslie’s workshop was great, so I went for the adventure. The title happened to be inspired by the Google project to use 20% of the time for projects. “Google described its startup ideal of “20 percent time,” where any employee could take a day’s worth of time out of the normal work week and come up with a cool project to work on”. Leslie had us go to the site of the Kiva project – empower people around the world with a $25 loan – and we had to find someone we wanted to loan $ 25. We had 6 (or 10?) minutes to make a presentation and put it on Google presentations and then convinve the group in one minute why the 25 dollar should go to our project. We had about 5 presentations and then we had to vote for the the one we wantedd to give the money to and then Leslie really made the loan of the 25 dollar with the money on her Kiva-account. What a wonderful idea!! Leslie also had a project: What’s your passion? The last workshop I went to was Karen Rowan’s Personalization workshop part 2. Yesterday before I went to part 1. This one was more about personalizing and making it into a story. Karen was coaching someone and then another person had to take over the coaching and she would coach the coach. Today the learning labs started. The masterteachers who teach these classes already started Monday to get to know the students and start their lessons. The beginning TPRS teachers first went to observe these lessons and the experienced TPRS teachers could choose the workshops and after the fisrts break the groups changed. I chose to go to the workshop by Katya Paukova about teaching higher levels. She started with the ACTFL guidelines; I saw kind of ressemblances with the Common European Framework, which is in fact something completely different with a different purpose. Katya told that she and her colleagues developed thematic units and she showed examples of current topics that they treated, which had to be interesting and controversial, in order that the students finally could have interesting debates. As resources they used : Youtube, articles and literary texts, announcements, advertisements, letters, maps and tables and also for the auditif part interviews, podcasts, public service announcements. In the second round the experienced teachers could observe in the learning labs and I went to the beginners French class of Sabrina Janczak. She taught a small group of 8 kids. They were cute and they did very well! Sabrina did lots and lots of repetititons; het three main structures were repeated more over a hundred times. Three students had a counter from a sports shop and every time they heard the structure, they had to push the button. Sabrina also did a few brainbreaks in between, like a song about the body with TPR-movements. We had a long lunch break of about an hour and a quarter and had a lunch; me outside in the warm Denver sun. In the afternoon I went to the workshop of Jason Fritze: Language acquisition? it’s ELEMENTARY! It’s always so inspiring to see Jason performing! 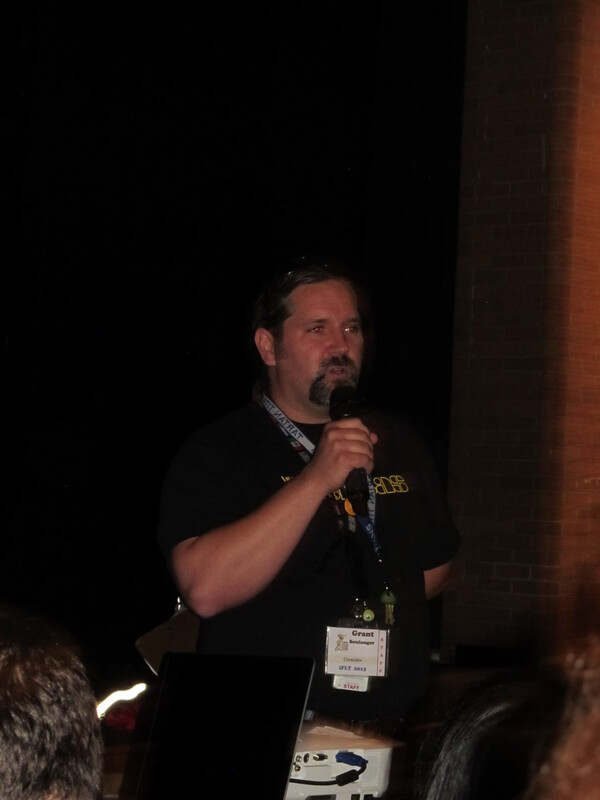 A few important messages from Jason: TPR is underestimated! Not only use it with lower levels! Jason uses TPR as “a commercial break”. TPR is so important for classroom management, not only with the little kids. 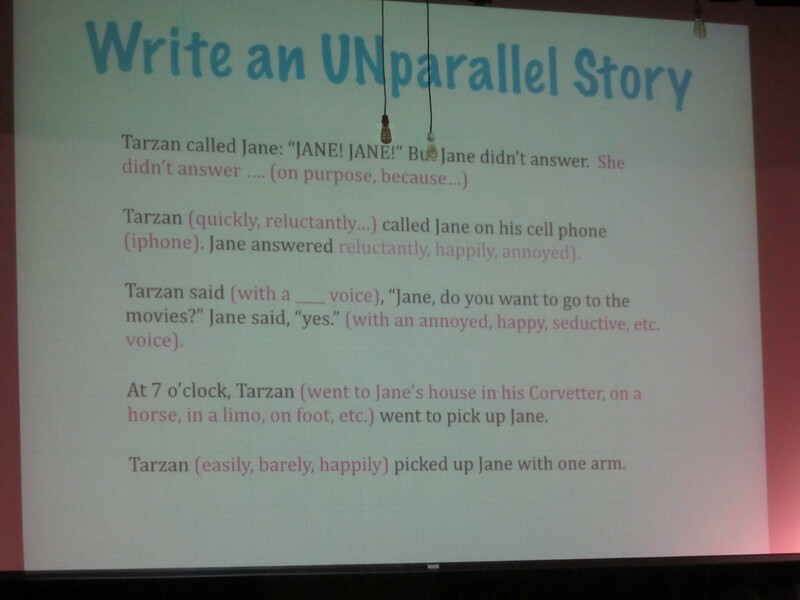 In TPRS chunks of language: formulaic sequences that can be learned as wholes or may be fused. Chunks build fluency. There’s grammar build into these chunks. Chunks are likely to be produced as whole units. After that I went to the workshop of Karen Rowan, Xtreme personalization, part 1. Karen asked us to walk around an meet two new persons and ask each other: if we were stuck in an elevator with a celebrity, which celebrity it would have to be? After it she asked us if we still remembered the names of the new persons we met and that most of us had forgotten. She said our own name is the most important and dear thing to ourselves and that it’s important to know other people’s names. Karen says that her ideas are not always understood at first, but later on everybody is using or doing it. Her point now is, to make your lessons Xtremely personnal, that’s the most important. Not the techniques; if you concentrate only on the techniques your teaching will become too sterile.